Our Mission is to share the beauty, wildlife and tranquility of the spacious Kalahari with nature lovers that needs an unpolluted environment in which to refresh. Our hospitality and cozy guesthouse will lead the way to an unforgettable Kalahari repose. Personal attention to your every need - only one guesthouse on about 7000 hectares!! One day in 1943 my grand father left the farm in Heidelberg to buy horses in Beaufort West. He and his fried were suppose to be back after three days. When he returned after two weeks he told my grand mother that he has bought a farm in the Kalahari and plan to move there. She should decide whether she and the children are going with. He has bought the farm Caledonia and they moved to Kuruman in 1944 and started the farming operation that was taken over by my father, Kobus Hauman, when he died in 1953. 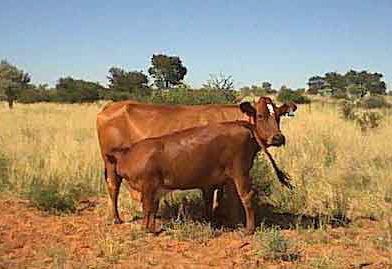 I have bought Soetvlakte from my father in 1994 and the Kalahari is part of our character.